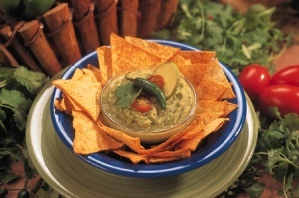 Cinco De Mayo The Party Food Dude Way! May 5th is the time to celebrate Mexican Independence the only way Americans know how…by drinking copious amounts of liquor and eating lots of food! Here’s a party menu that might not be the most traditional, but is sure to get everyone in a fiesta state of mind. What would Cinco de Mayo be without a nice, frosty margarita? Get the party going with a nice blend of margarita mix, triple sec, tequila and lime juice. Then give your cocktails a little extra kick with this spicy syrup featuring the kiss of the habanero. This recipe calls for mango juice, but use whatever you like: guava, papaya, peach nectar, even plain old orange juice. Pour all ingredients into a saucepan and bring to boil over medium-high heat. Reduce the heat to medium and continue cooking until the juice has gotten very thick. Let it cool. To serve, either dip a margarita glass into the syrup to coat its edge or pour a teaspoon of the syrup on top of a drink. Pour the milk into a skillet with high sides over medium heat. Let it come to a boil. The minute the milk boils, add the cheese and stir to let it melt. Once it has melted, add the green chilies. In a second skillet over medium high heat, add the vegetable oil. When hot, add the garlic, hamburger, and the cumin. Cook until the hamburger is browned. Drain any liquid which remains. Construct the dip by layering first the refried beans, then the hamburger, then the enchilada sauce, then the cheese sauce, and finally more Monterrey jack cheese. Put the dip in the oven until the shredded cheese melts. Remove and top with green onions, tomatoes, and black olives. Serve with the tortilla chips and watch it disappear. Albondigas is the Spanish word for “meatballs.” These little party appetizers are balls of ground chicken, corn, and jalapenos rolled into balls. Served with a fancy salsa or sour cream on the side. Mix all of the ingredients in a bowl except the olive oil. When well incorporated, roll the mixture into quarter-sized balls. In a skillet over medium-high heat, add the olive oil and let it get warm. Cook the albondigas in small enough batches so that they do not touch each other in the pan. Cook them for about 14 minutes, turning them every 3-4 minutes. Break one open to test it to make sure they are cooked all the way through. Alternately, you can brown the albondigas on each side and then put them in the microwave. Give the average quesadilla a kick by adding a nice fresh assortment of sautéed Mexican-inspired vegetables. There’s no reason the health conscious and vegetarians at your bash need go hungry! In a skillet over medium-high heat, add the olive oil. Once hot, add the onions and the poblanos with a good pinch of salt. Cook until the poblanos are soft. Then add the green onions, garlic, and mushrooms. Continue cooking until the mushrooms have turned dark brown. Set aside to cool. To build the quesadilla, microwave a tortilla for 15 seconds. Next, sprinkle 1/4-1/2 cup of cheese over half of the tortilla. Then put some of the filling on it. Fold and cook either in a panini press or in a nonstick skillet with another skillet pressed on top of it until the cheese is nice and melty. Mole is a traditional Mexican sauce made from raisins, chocolate, chilies, bread, salt, pepper, garlic, and at least ten other ingredients. A classic mole can take anywhere from eight to twelve hours to make properly. Or you can grill up some chicken, slather it in store bought mole and serve it to your friends in about 30 minutes! Sprinkle the chicken liberally with salt and pepper. Cook the chicken by either grilling it (6-8 minutes per side), sautéing it in a skillet (again 6-8 minutes per side), or baking it in a 350 degree oven for 20-30 minutes. Whichever way you decide to cook the chicken, cover it generously with mole sauce and cook it an additional 2-3 minutes so that the mole sauce gets cooked into the meat. Before serving, microwave the corn tortillas for 15 seconds or heat them about one minute per side on a skillet over medium high heat. Then serve the mole chicken with the tortillas, pico de gallo, sour cream, and avocado for a make-your-own taco bar. If you want to pull this party off without a hitch, here is a plan for getting all of the cooking done.